Jet Pro Auto Wash understands the importance of community, youth and organizations. Because of this, Jet Pro Auto Wash wants to help give back to the community. Community fundraising through commercial car washes is a way to control sewer overflows, promote a clean environment and build community-business partnerships. There are many benefits to using a commercial car wash for your fundraising needs. Help save and recycle water. Keep our streams and rivers pollutant-free. Fewer scarce resources are used at a commercial car wash as they use 60% less water. Relieve most of the hard work. Jet Pro can customize a fundraising campaign or event for your group and there are many options available. Among the most popular is for your group to sell discounted tickets which may be redeemed at any time. Your group can also sponsor an event in which you participate in the car wash by drying, vacuuming, and detailing. Contact us to set up a fundraising event tailored specifically to your goals and participation level. 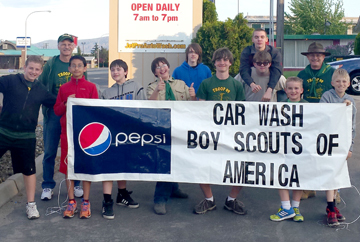 Boy Scout Troop 89 raised nearly $1,200 on their 2015 fundraiser! The "Power Washers for Drew" raised $2,000 to benefit the family of 5- year-old Drew Stephens who was recently diagnosed with Leukemia. He is at Children's Hospital in Seattle and probably will be for at least 6 months. Anyone still wishing to donate can do so in an account set up for Drew Stephens at Numerica Credit Union.